Though hydrogen shows a great promise as a next-generation fuel, developing hydrogen storage systems remains a major barrier to transitioning to a hydrogen economy. While hydrogen storage alloys already available for use in fuel cells and batteries remain an important area of development, a major current area of focus is hydrogen storage solutions for hydrogen-powered vehicles. Systems for this application must be able to store sufficient hydrogen for a conventional driving range of at least 300 miles, while adhering to demanding constraints in terms of weight, volume, operating conditions, efficiency, safety, and cost. Refueling time and durability of the systems additionally remain areas of focus, as currently available technologies require excessive refueling time and have a limited number of lifetime refuel cycles. The traditional way of transporting hydrogen for use as fuel in a vehicle involves cooling or compressing it and storing in specially designed tanks. These are the most mature hydrogen storage methods, but have significant drawbacks. 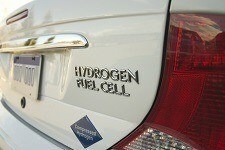 Both compression and cooling have energy costs that make hydrogen fuel usage less efficient overall. Additionally, tanks must be either insulated to maintain low temperatures or specially built to contain pressurized gas--design features which add weight, volume, and substantial cost. Finally, neither cooling nor compression alone are capable of storing hydrogen at sufficient density to meet long-term goals necessary to make hydrogen vehicles plausible replacements for traditional cars. Recently, cryo-compressed hydrogen storage tanks have been developed that use both cooling and pressurization to compact the gas, and this does allow sufficient amounts of gas to be stored on board a vehicle to meet range requirements, but these systems require both insulation and pressure resistance, and therefore come with the design and cost disadvantages of each. Additionally, specially designed tanks may improve the properties of cryogenic and pressurized hydrogen storage. In one example of this, glass capillary arrays are installed in larger pressure resistant vessel made from steel. This technology was developed by a team of Russian, German and Israeli scientists to provide storage and controlled release of hydrogen in mobile applications and has achieved the US Department of Energy 2010 targets for on-board hydrogen storage systems. The glass capillaries are closed by melting at one end and closing the other end with an alloy after adding hydrogen to the steel vessel. The system is pressure resistant up to pressures of more than 1500 bar. Issues with this technology include the fact that even minor defects in the glass structures like bubbles, cracks or grooves strongly increase stress peaks and therefore decrease the pressure resistance. In the short term, compressed gas tanks will continue to be used despite their shortcomings because the technology is already commercially viable. Research is being conducted to further lower the costs of the materials used in manufacturing high-pressure gas vessels, particularly carbon fiber. In the medium term, cryo-compressed tanks or other novel cold/compressed hydrogen tank designs may come into use as well. However, it is generally considered that some type of materials-based hydrogen storage must become viable in order to meet long-term hydrogen storage goals, especially as the energy necessary to cool or compress hydrogen will always negatively impact the energy efficiency of systems using hydrogen tanks. Chemical hydrogen storage technologies are those in which hydrogen is generated through a chemical reaction. The reaction may be induced through heating, passage through a catalyst containing reactor, or combining the carrier chemical with other reactants to induce hydrolysis. These reactions typically leave behind hydrogen-depleted carrier compounds which must be removed from the vehicle for off-board rehydrogenation. Carbohydrate (Polymeric C6H10O5) is the most abundant renewable bioresource available. Carbohydrate presents high hydrogen storage densities as a liquid with lower pressurization and cryogenic constraints. It can also be stored as in solid form. In 2007, biochemical engineers from the Virginia Polytechnic Institute and State University and chemists and biologists from the Oak Ridge National Laboratory announced a method of producing high-yield pure hydrogen from starch and water. The emerging cell-free synthetic biology technology (cell-free synthetic pathway biotransformation) has allowed hydrogen production by use of renewable carbohydrate as a high-density hydrogen carrier and energy source. Renewable carbohydrate can be isolated from plant biomass or could be produced from a combination of solar electricity/hydrogen and carbon dioxide fixation mediated by high-efficiency artificial photosynthesis mediated by cell-free synthetic pathway biotransformation (SyPaB). Formic Acid has been used as a hydrogen storage material since 2006 when researchers of EPFL, Switzerland first confirmed that the catalytic decomposition of formic acid provides efficient release of hydrogen. Its decomposition yields CO-free hydrogen while the co-produced carbon dioxide can be hydrogenated back to formic acid which makes hydrogen suitable for fuel cell applications. Carbon monoxide free hydrogen has been generated in a very wide pressure range (1-600 bar). Initially this process was designed using ruthenium-based catalysts, but recent progress has been made on producing other, less expensive and/or higher performing catalysts. One such catalyst reported is a cobalt gold palladium nanoalloy on a carbon support, while another was consisted of boron-doped palladium. Formic acid contains 53 g L-1 hydrogen at room temperature and atmospheric pressure, equivalent to 4.3 wt% hydrogen. Pure formic acid is a liquid with a flash point of 69 °C (cf. gasoline -40 °C, ethanol 13 °C). 85% formic acid is not inflammable. Ammonia borane and many of its derivatives have been studied comprehensively as hydrogen carriers. Molecular complexes containing protic and hydridic hydrogen such as ammonia borane provide between 8 to 16 weight % hydrogen at acceptable temperatures, and meet many important targets including fast kinetics of hydrogenation and dehydrogenation, thermal stability, and safe handling. Challenges with these materials include the presence of volatile impurities and the formation of solids at working temperatures. A number of approaches to alleviate these issues have been considered. Embedding ammonia-borane nanoparticles in a porous scaffold or in hollow nanoparticles allows for greater control over hydrogen release kinetics and selectivity. Another approach being taken is to add some carbon to the nitrogen, boron, and hydrogen carriers in hopes of producing materials that remain in liquid phase and have desirable thermodynamic properties. Liquid organic hydrogen carriers are organic compounds that can be reversibly hydrogenated and dehydrogenated in the presence of a catalyst. The dehydrogenated forms of these compounds are generally polycyclic aromatics, and when hydrogen is absorbed the double bonds are replaced with hydrogens. This technology is particularly attractive due to the ease of storage and transport of liquid fuels and their high storage capacity for hydrogen--currently 7-8 weight %. Unfortunately, the dehydrogenation reaction is strongly endothermic, requiring significant heat input to release hydrogen for use. Ongoing research also seeks to optimize catalysts use for hydrogenation and dehydrogenation, as currently typical catalysts require significant quantities of precious metals such as palladium and platinum, and some require unfeasible operating temperatures to achieve practical kinetics. Additionally, the energy conversion efficiency of the dehydration reaction requires further improvement. The major advantage presented by liquid organic hydrogen carriers is that they could be stored and transported similarly to fossil fuels, and therefore could make use of existing infrastructure. Like the technologies usually termed “chemical hydrogen storage”, metal hydrides store hydrogen by forming chemical bonds between hydrogen and the storage material (chemisorption); however, bonds in most metal hydrides are weaker than those in chemical hydrogen storage, so these materials are typically placed in their own category. Some metal hydrides are solids which can be turned into pellets, while others are easy-to-fuel liquids at ambient temperature and pressure. These materials generally have good energy density by volume, though their energy density by weight is often inferior to the top hydrocarbon fuels. Hydrides chosen for storage applications provide low reactivity (high safety) and high hydrogen storage densities. An ideal hydride for fuel cell applications would be able to operate in a range of 1-10 atm and 25-120 degrees celsius while also exhibiting high gravimetric and volumetric hydrogen densities. The difficulties of using hydrides and related compounds for hydrogen storage are related to the conditions required for hydrogenation and dehydrogenation, and the kinetics and reversibility of these processes. Hydrogen is released from or absorbed into hydride materials through the manipulation of temperature or pressure. Compounds in which hydrogen is tightly bound typically require very high temperatures for hydrogen release, while compounds with weaker binding typically require high pressure to induce and sometimes to maintain storage of hydrogen in the material. Multiple avenues to develop ideal kinetics, reversibility, and equilibrium pressures for hydrogen storage in hydrides have been investigated. Destabilized hydride systems typically use an alloy of two hydrides with disparate properties to produce a single storage material with desirable attributes. Another approach involves the nanoconfinement of metal hydrides within nano-sized molecular scaffolds. Carbon aerogels with nanometer pore sizes have been used for this strategy, and additionally hybrid systems which embed hydrides within metal-organic frameworks (MOFs), which are adsorptive hydrogen storage materials, are under investigation. Currently transition metal-based AB2-type alloys and rare earth-based AB5-type alloys are the only metal-based hydrogen storage materials that have been developed to the point of mass production and commercialization, and these are found in devices such as batteries, air conditioners, and heat pumps. Hydrides with both the capacity and the operational parameters required for fully hydrogen-fueled vehicles have yet to be developed. In addition to conventional metal hydrides, proposed hydrides for use in a hydrogen economy include complex metal hydrides, which contain a group I or II metal along with either aluminium (alanates) or boron (borohydrides), as well as some metal amides and imides, including LiNH2, NaNH2, Mg(NH2)2, LiMgN and Ca(NH2)2, have also been investigated for use in metal-based hydrogen storage systems. Complex hydrides typically have higher hydrogen bonding strength than conventional metal hydrides, but still less than is typical in chemical hydrogen storage. Complex metal hydrides have the potential for higher gravimetric hydrogen capacities, but actual materials with appropriate properties for use in vehicles are not yet available. Systems using amides and imides have been shown to be particularly sensitive to oxygen and water impurities at the parts per million level, which would require that the hydrogen to be be stored in such materials to be of extremely high purity. Adsorptive hydrogen storage utilizes porous or nanostructured materials with the ability to reversibly adsorb hydrogen. Unlike in hydride or chemical hydrogen storage technologies, where hydrogen chemically binds to the storage material forming new compounds (chemisorption), in adsorptive hydrogen storage the hydrogen is bound to the storage material through only weak van der Waals forces (physisorption). The difference in binding strength means that adsorptive technologies have the advantage of faster adsorption/desorption kinetics and full reversibility of the process. The disadvantage of adsorptive technologies is that they often have lower hydrogen storage capacities than chemisorption-based storage systems. Hydrogen is generally added to and removed from adsorptive storage materials through the manipulation of temperature and pressure. Metal-organic frameworks are perhaps the most developed of these technologies, but recent progress in nanotechnology and micro/mesoporous materials is producing a wide array of exciting new materials. Metal-organic frameworks (MOFs), a class of ultrahigh-porosity crystalline materials with enormous internal surface areas, tunable pore sizes, and adjustable internal surface properties, have recently emerged as some of the most promising hydrogen storage materials. Research interests on hydrogen storage in MOFs have been growing since 2003 when the first MOF-based hydrogen storage was introduced. Typically these materials require low temperatures for significant hydrogen absorption, sometimes along with increased pressures. MOFs with the ability to hold hydrogen at room temperature are under investigation, but have yet to reach the capacities possible with lower temperatures. Currently, MOFs materials operating at 77K and high pressures have shown total hydrogen capacities from 6-15% by weight, which is sufficient to meet US DOE fuel cell vehicle targets. However, lower pressures and higher temperatures are required for light-duty fuel cell vehicles, and at room temperature MOFs have only shown about 1% hydrogen capacity by weight. Ongoing attempts to optimize MOFs for hydrogen storage have used a variety of techniques, including the incorporation of guest metal ions, altering the organic components of the MOFs, or introducing platinum or palladium nanoparticles into the pores of the MOF framework. Additionally, MOFs are of interest for use in hybrid systems, where chemisorption-based storage materials are embedded within the matrix of a material that exhibits physisorption. 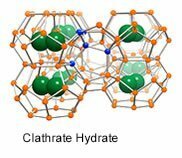 Clathrate hydrates are crystalline water-based solids that resemble ice, in which small molecules such as hydrogen can become trapped inside cages of hydrogen-bonded water molecules. In initial studies, this type of storage appeared impractical due to the extreme pressures and temperatures required to store significant quantities of hydrogen. In recent years, the use of various “promoter” compounds such as tetrahydrofuran (THF) has seen some success, but the resultant materials currently lack the storage capacity necessary for practical use, and the kinetics of clathrate hydrate formation remain far from ideal. Research into novel promoter compounds, as well as the use of hybrid technologies which would embed clathrates into supportive adsorptive media, is ongoing. Carbon nanostructures are a major area of interest within nanotechnology, and a variety of carbon nanomaterials have been considered as potential hydrogen storage media. Graphene, a two-dimensional compound consisting of an atom-thick layer of interconnected carbon molecules, can be induced to adsorb hydrogen, and will release it again upon heating to 450 degrees celsius. In some carefully designed configurations in which graphene layers are spaced a few angstroms apart, this technology could meet storage density goals while operating at moderate pressures. Alternately, sheets of graphene can be induced to fold into small enclosed structures, and some have proposed using this property to produce small cages in which to store hydrogen. Carbon nanotubes (CNTs) have additionally been investigated as hydrogen storage materials. Alone, CNTs do not have sufficient hydrogen storage capacity to be practical, but they can be either doped with nanoparticles of other elements or compounds, or joined into novel nanostructures which have the capacity to store hydrogen. One such nanostructure, termed Super Diamond by its designers, has been shown to have a 22% gravimetric capacity at 77K and 8% at room temperature. Carbon nanotubes have also been included in nanocomposite storage materials, providing structural stability and enhancing storage capacity. None of these technologies is mature enough for practical use, but carbon nanostructures for hydrogen storage remain an active area of research. American Elements manufactures a comprehensive array of materials for hydrogen storage applications, including hydrogen storage alloys, carbon-based materials, and amine boranes.